A portable studio or sometimes called a light tent is a box-like device that allows you to shoot professional quality photos virtually anywhere. Whether at home in a makeshift lab or on the road. They’re great if you want to shoot photos of products on a white background that makes editing in apps like Photoshop easy (Source). Portable photo boxes fold down to a compact, flat square or circle. When you’re ready to shoot, unfold them, set up the lighting, position the object you want to photograph and take your photos (Source). When taking product photos, experts recommend using light bulbs from the same manufacturer and of the same wattage because the hues differ from manufacturer to manufacturer and the camera can pick up the difference even if your eyes can’t. Also, consider using an umbrella between your flash and your object to soften the light (Source). The URiver photography box is a great mini light box that’s ideal for taking pictures of small items like toys or jewelry. This studio comes with four backgrounds: black, green, red, and white. It’s easy to fold, transport, and set up. Buyers said this lightbox was easy to set up and use, and the magnets kept it sturdy. The Lepotec is a portable tent that comes with a built-in two piece white LED strips for bright lighting. These lights can act as two light sources or be adjusted to a single strip. This, like the previous lightbox, also comes with four backgrounds: red, black, white, and green. Unlike old photo tents that collapsed easily, this one uses an upgraded button design for stability. Lastly, like the previous, this one is better suited to photographing small objects. The EMART lighting tent is also designed for photographing small toys, jewelry and other small objects. This device comes with a tripod for your smartphone and a white and black background. Two LED lights give out good lighting to help reduce shadows, and it comes with a carry bag. The LimoStudio light box is a 16×16 box that’s ideal for setting up on a tabletop for small object photography. Like the previous product, this one also comes with a tripod for shooting photos with your phone. Background colors include: red, black, blue, and white. Lastly, the LED lights put out plenty of light to minimize the contrast and shadows. Last we looked at the Amazon Basics portable photo box. This studio measures 25x30x25, which means you can shoot a variety of smaller type objects in this box. The LED lights can be directed allowing you to get better highlights and shadows, and to eliminate blown out areas. It also includes a hole in the top for taking shots from above. While this is overall a good light tent, you only get a white backdrop with this. Lastly, with this you get Amazon’s 1-year warranty. This foldable photo kit offered by AmazonBasics is easy to carry, durable, and an excellent choice for novices. Users love that the lights are positioned for optimum contrast, but some do note that they are not as bright as they expected. The AmazonBasics mini photo studio measures 25” x 30” x 25”, and it requires no assembly. What’s more, you can set it up in less than a minute, and when you don’t need it, it collapses into a thin portfolio case. Another excellent thing about this product is the front 3-door system, which maximizes image angles and reduced reflections. In addition to this, the built-in LED lights can provide 5600k daylight with high color rendering index. As a whole, buyers have a high opinion of this mini photo studio, and they praise its design, performance, and durability. 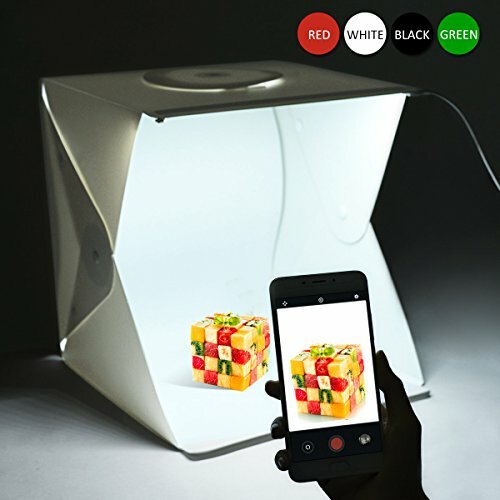 A reviewer comments that he is impressed by the constructions of the portable light box and that you can position the camera at different angles. He adds that it folds in seconds and that the lighting is adequate for good photo shots. Another buyer states that the photo tent is so spacious that his cats can fit comfortably inside. A user also mentions that he was surprised by the quality of the pictures and that the portable studio is light enough to carry around. However, a few customers have noted that the backdrop has a crease in the middle and that the pictures need editing. Some also complain that the lights are not balanced. 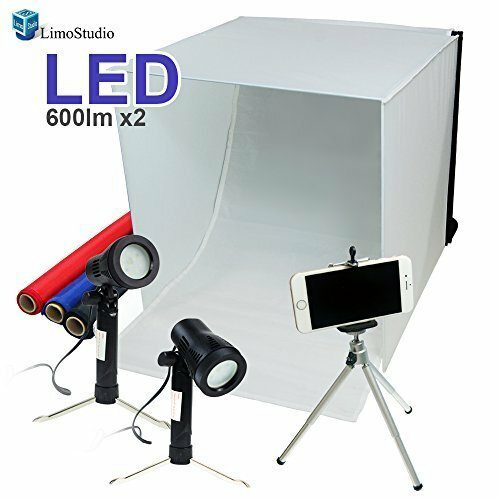 If you’re looking for an affordable portable photo studio, you might take a look at this kit offered by LimoStudio. Users love the price, but some do note that the lights are not bright enough. 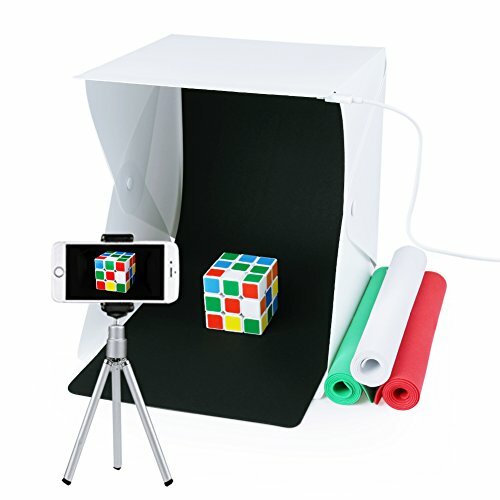 The LimoStudio table top photo-shooting box features one mini stand tripod, a 16-inch cubic with color backdrops, two LED lights, one phone clip holder, compatible with any smartphone, and a white tent. Another excellent thing about this product is that you can adjust the height of the stand up to 8-inch in addition to the 5500 Kelvin LED light. What’s more, you get red, black, blue, and white backdrop fabrics. 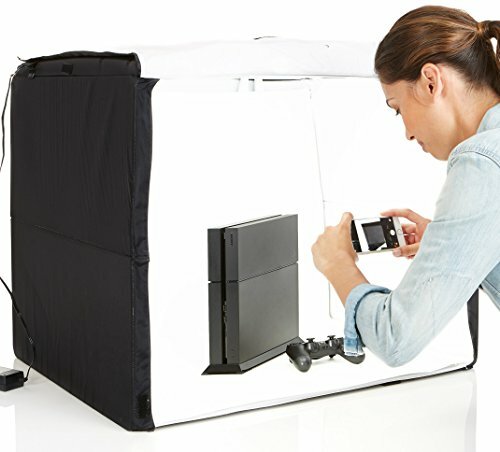 A buyer comments that this is the best portable photo studio he has ever used and that he is impressed by its quality and design. He adds that you can set it up in minutes and fold it down quickly when you don’t need it. Another reviewer shares that the package arrived well-packed and that it contains everything necessary to start shooting right away. He highly recommends it to people looking for cheap portable photo studios. A user also mentions that he is satisfied with the quality of the pictures and that the lights are easy to position. However, some customers have noted that the backdrop fabrics get wrinkled easily and that they have creases. A few also state that the tripod is cheaply made. This foldable photo-shooting box tent offered by Emart is affordable, convenient, an excellent choice for taking pictures of small objects like toys and jewelry. Users love the tripod holder for smartphones, but some do note that the box is smaller than they expected. 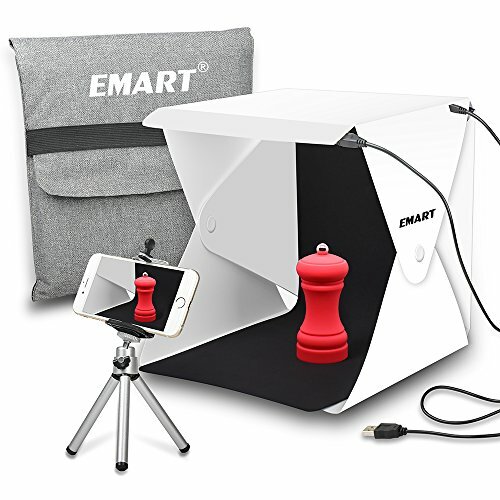 The Emart portable photo studio measures 9.65” x 9.65”, and it features two LED light strips to provide continuous lightning, and one white and one black backdrop. What’s more, you can carry the shooting kit easily when folded, thanks to the carry case bag, which is included in the package. In general, users have a mixed opinion regarding the Emart shooting light tent, and they agree that it can work if it’s designed better. A happy buyer mentions that the box is easy to set-up and that he is satisfied with the brightness of the lights. He adds that the storage bag is useful for traveling and that the tripod holds the phone/camera steady. Another purchaser also comments that magnets hold the shooting tent and that you can fold it quickly. On the other hand, an unhappy customer observes that the magnets are not enough to keep the box together and that the two LED strips are not bright enough. Another user also states that the tent is too small for his liking and that the lights don’t stay on. This portable studio tent offered by Lepotec is handy, light, and suitable for artists, online sellers, or beginners alike. Users love that the LED strips have separate switch controls and that they can adjust the light to their liking, but some do note that the material is cheap. The Lepotec foldable shooting box measures 16” x 16” x 16”, and it features dual super bright LED strips with 600Lm brightness, and upgraded button design to avoid collapsing. What’s more, you get four photography backgrounds – black, white, green, and red for different shooting effects, and a USB cable to connect it to your computer or adapter. In general, purchasers are satisfied with the design, usefulness, and durability of this shooting tent, and they recommend it to anyone looking for cheap portable shooting studios. A buyer mentions that a USB cable powers the LED lights and that he finds them bright enough. He adds that he likes the four backdrops because he can do a lot of experiments. Another user comments that the shooting box folds quickly and that it’s easy to operate the lights. 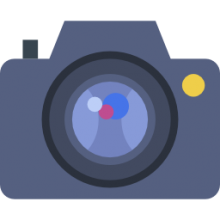 A reviewer also shares that he uses the portable photography studio daily and that it’s perfect for amateur photographers. However, some customers have noted that the photo box is flimsy and that it easily collapses. They add that the snaps don’t stay in place and that the light is not as bright as they expected. If you’re looking for a cheap foldable shooting box for home, you might try this mini folding light tent offered by URiver. Users love that the easy assembly, but some do note that it’s suitable for small objects only. The URiver portable photo studio measures 9.5” x 9.5” x8.7″, and it features a button design for improved stability, 20pcs bright LED for uniform light and a USB cable for charging the lights. Another great thing about this mini folding photo kit is that you get four background fabrics – white, black, green, and red to achieve different effects. What’s more, once you fold the tent, you can store it anywhere and save space. In general, users have a favorable opinion of the URiver mini shooting tent, and they recommend it to as one of the best cheap portable studios for amateur pictures. A reviewer comments that the box is tiny, but it’s perfect for clothing, shoes, or jewelry and that it suits his purpose. He adds that the light is sufficient and that it doesn’t take much space when folded. Another buyer mentions that he likes the built-in lights and that they are brighter than he expected. A purchaser also observes that the product breaks down quickly and that the fabrics are a nice touch. However, some customers have noted that the background is made of cheap fabric and that the light is not sufficient for good pictures. One user also complains that the tent fell apart right out of the box. Learn how to set up your own photo studio at home on a limited budget. See how to use a point-and-shoot camera, window light, white paper, and foam board reflectors to create product images like the professionals. Get buying recommendations, and learn how to arrange your home photo studio equipment. Studio portraiture is very specialized and has always been the “elite” photographer’s playground. While it is true that high-end studio photography requires a great amount of study, practice and mentoring, it is also equally true that an interested amateur with some decent equipment can take very nice family and portrait photos with some practice. You are going to need a few key elements for some basic studio photography. First is some studio lighting. Three strobe lights will likely give you as much studio lighting as you will need to get by in most lighting situations. Some studio setups have as many as 6 lights, reflectors, and various diffusers and use high end 600-800 Watt per Second strobes that cost thousands of dollars. You can likely find a good starter set with 300-350 WPS lights in places like eBay, Henry’s or your local camera store. Next item(s) will be backdrops. You may want to consider a number of things. Good quality Muslin backdrops can be found for very reasonable money on eBay. I buy all my backdrops from eBay vendors. Like anything, make sure you check the seller rating and their eBay store to make sure they are reputable. You may also want to consider a backdrop stand. That will assist in properly hanging your backdrops in almost any location. Now that you have some of your basic information, you will need to select colors for your backdrops. A nice standard grey, blue and maybe a brown/red base backdrop will usually be enough to get you going. You also need to know the size. 9×6 is a good standard muslin used for portraits however if you can get a good deal, go for 10 x 10 and that way you can have some extra backdrop to use for full body shots and even enough for some small group shots. Backdrops of that size are generally around $100 each however, you can often find great deals on eBay if you are patient. Now that you have the gear, it’s time to decide how to set up your studio. Hopefully you have already found yourself some room in your house that you can use as a “studio only” location. If not, you can go “mobile” with most equipment and set up wherever there is room. If you have the ability to set aside your “stage” and keep it set up, the best thing to do is to set your backdrops up against one wall and your lighting off to the side. Your lighting needs will vary from shot to shot so it is best to just have the lights on their stands set to the lowest point on the light stand. When you know what type of lighting you are going to need, you pull your lights as needed and set them up with a softbox and umbrella. Therefore, Studio shooting can be a lot of fun. It makes for really great home done family portraits and can even make you a couple dollars. Once you start feeling comfortable taking portraits, why not start doing some friends portraits? After some practice, some study and some experience with various portrait styles; you will start to see some great results and will be the envy of all your friends!